Hosanna, Hey-sanna, Sanna, sanna, ho! I am conditioned at this time of year to hear that song and to see the rock opera Jesus Christ Superstar, because I actually saw the original Jesus Ted Neely perform in a live stage version a long time ago. For some reason, it stayed in my mind. And…why does Jesus always resemble Michael Bolton? We all visualize it in some way. 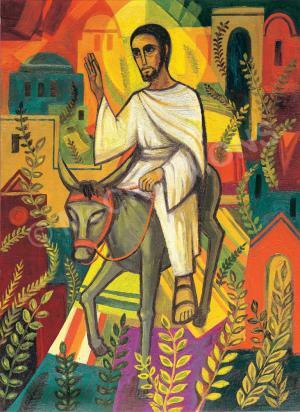 How do you see the story of Jesus of Nazareth entering Jerusalem at Passover time? I personally like Jesus on the T-Rex. Of course, it makes sense. How we visualize the story, of course, is determined by our culture, time period, and upbringing. 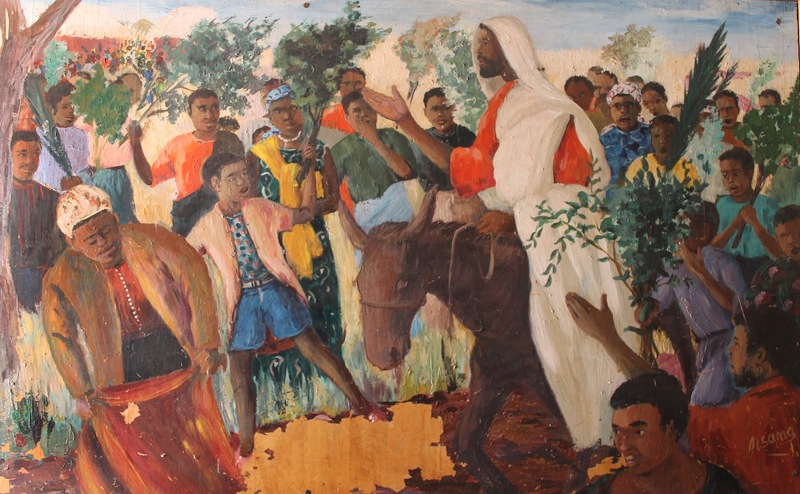 It’s related to whether or not we grew up with palm branches on this particular Sunday and sang “Hosanna” songs or whether we did none of those things. Perhaps this story is just a quick pit stop on the way to Easter—something to spend very little time on and something that could in fact lead to crucifixion and death, which are not nearly as pleasant as egg hunts, chocolate bunnies, and Easter baskets. But this story deserves our attention—that is, if you wish to take the journey to the end of the Gospel story. But the road goes through Zechariah. Zechariah the prophet from the OT is the only way to make sense of this. You see, this story is told by the 4 Gospels: Mark, Luke, John, and Matthew. Mark wrote it first, and the others borrowed and altered the first version to fit their perspectives and their audiences and their time period. It’s like hearing the same story as told by four different people who never met each other. But in the end, all four stories lead us to one question. So consider some details we get. We’ll stay in Matthew. Jesus came to Jerusalem from the east. Bethphage, called the house of figs. The Romans [soldiers], however, came from the west to maintain order during the Passover party. Jesus’ entry mocks the Romans. It is counter-empire. 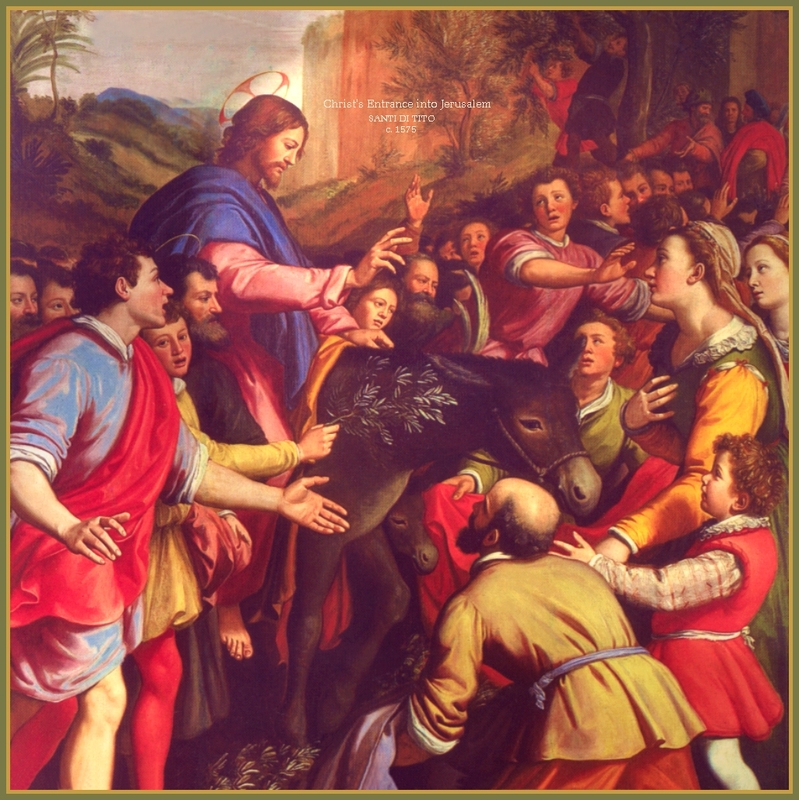 How many donkeys and why? Two. See Zechariah again. Donkey and a colt [baby]. 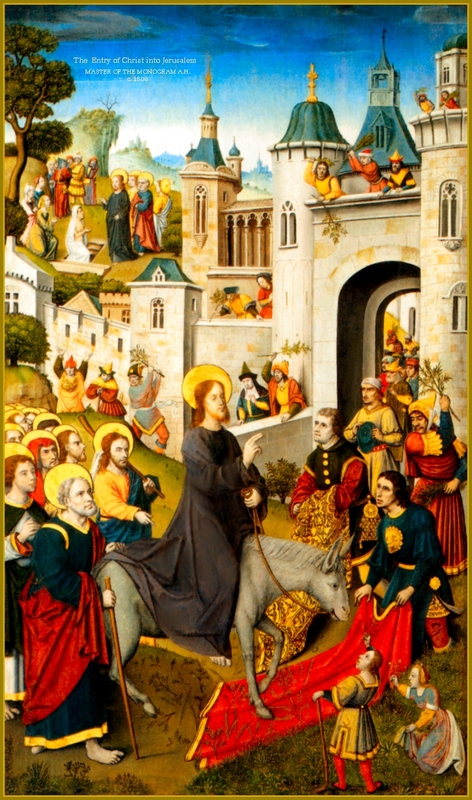 The quote “humble and riding on a donkey, on a colt, on the foal of a donkey” is like “your word is a lamp to my feet and a light for my path,” a Hebrew repetitive wordplay; one thought that is expressed in two ways. Maybe Matthew misinterpreted Zechariah? No, not really—that wouldn’t make sense. Matthew wrote to a Jewish audience and knew about the prophecy and he also had Mark’s Gospel as a reference [with only one animal]. Matthew tweaks the OT texts to fit the style and message of this particular telling of the story. The crowds were not what we may think. They weren’t Jerusalem crowds, because as mentioned before, Jesus was from the north [Galilee] and Jerusalem was in the south [Judea]. Jesus of Nazareth was not a superstar in Jerusalem. So the crowds were his followers, kind of Jesus flash mob formed outside of Jerusalem city, to greet Jesus on his way in and to mark this moment, because they really wanted things to change. So the people shouted things from Psalm 118. They reminisced about the good old days—when King David was ruler of Israel and things were better. Could Jesus bring back prosperity for them? Some of them saw Jesus as a prophet, others as a king. Some thought he was a teacher, a Rabbi, a brother in a struggle for independence. However they saw him, people threw their cloaks to the ground. This was to show their hope that Jesus would be something big. It was respect. It was Matthew’s red carpet moment. Jerusalem was Hollywood and Jesus, at least the people hoped, would be a superstar. Now, there were no palm branches anywhere in Matthew’s story…just branches. Why don’t we wave figs instead? Or olives? That would make more sense. Well, we have John’s Gospel to thank for that—the only one that mentions palm branches. And before you blink, the story is over. We’re left with the intriguing ambiguity of the crowd. And the crowds said, “This is the prophet Jesus from Nazareth of Galilee. And then, the story continues. Jesus goes to the temple and starts throwing furniture around. A king? A prophet? Just a dude from Galilee? It may sound strange, but I’ve come to the conclusion in my own journey that perhaps this question who was Jesus is our own obsession and not really what Jesus himself was concerned about. Nearly everyone tried to define who he was. Even the Romans and temple authorities who arrested him and eventually crucified him tried to figure out who this Jesus of Nazareth really was. But each time, Jesus himself refused to accept the titles given to him. Makes me wonder: what would Jesus say to us now as we do the same thing? We give Jesus titles and want him to be what we need him to be. Will he be our king, our Lord, our Savior, our Messiah? Will he save us from our personal problems? Will he give us all the answers if we just praise him and shout encouragement at him? Will this Jesus be all that we want him to be? I don’t think that this is what we ought to obsess over anymore. You see, in the Gospel stories, Jesus of Nazareth is not worried about titles and what people believe about him. He cared about how people lived. How did they treat others? How well did they love? Did the show mercy when it was difficult? Did they show hospitality to strangers? You see, we continue to argue about who Jesus was and is and the Gospels tell us so what? You’re wasting your breath and your time. How does this Jesus of Nazareth—his teachings and his life—how does he inspire you to live? Because when it’s all said and done, our perspectives and opinions will always be subjective. But our actions will speak louder. Our love and compassion will make an impact on the world. So how will this story inspire you to live?